The peach tree (Prunus persica) is a fruit-bearing tree that originated from China. This is a small sized tree that can grow only 8 meters high. This tree species loves heat and it is affected by late frosts. Despite this, it has a constant production for 10-15 years. Its leaves have a lanceolate shape, the flowers are small, solitary, of varied colors (pink – white). The fruit is a globular drupe, with a smooth, flavored and juicy pulp. 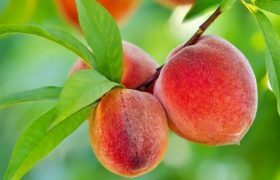 The peaches have high nutritional values, as they are recommended in the diets of the people suffering from liver, kidney diseases, or of anaemic children, or of convalescent people. These contain sugars, protein, vitamins (B1, B2, B6, A, E), potassium, phosphorus, calcium, sodium, zinc, iron, copper. The peach tree grows a widely spread root system. Most of the roots are located 50-80-cm deep. Regardless of the planting density, the roots will not overlap. The peach tree’s aerial parts rapidly grow during the first vegetation years. It grows 2-3 sprouts series that fill the crown. Once the tree starts its vegetation period, the intensity of the vegetative growths decreases. The peach tree has a good production, even at 2-3 years after planting, as it is a precocious species. It bears fruit annually, it does not have alternating fruition periods. The peach needs a lot of heat and sometimes it is not fully adapted to the temperate climate conditions. The peach tree needs a sum of around 3000 degrees Celsius during its entire vegetation period. During winter is withstands temperatures as low as -24 degrees Celsius. Its buds can withstand temperatures as low as -3.9 degrees Celsius, but the flowers abort if the temperatures are lower than -3 degrees Celsius. 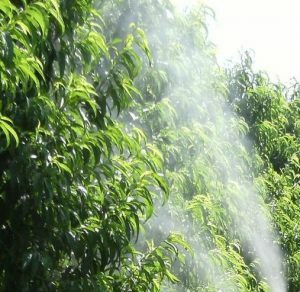 The peach tree can live through a period of prolonged drought, but for increased productions, the water plays a limiting role. If the needed water intake lacks, the fruits will remain small, flattened, the production will be diminished both in terms of quality and quantity. The peach tree reacts well to irrigation. The excess soil water will asphyxiate the roots. The tree has high light demands. For the tree to properly exploit the solar radiation, cuts will have to be applied to properly air the crown. The orchard must be placed on slopes with a southern orientation. If the light lacks, the sprouts grow only a bit, the trees are sensitive to frostbites and the production is decreased in quality and quantity. 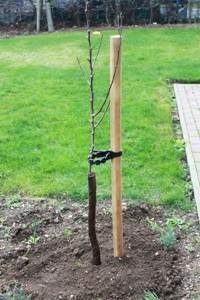 The peach tree needs to be planed of fertile soils, with a proper exposure. If the parcel is inclined, the trees need to be planted only on the superior part of the slopes (this placement technique reduces the loss caused by late frosts). The tree rows must be oriented towards north-south, as this also helps in reducing the loss caused by late frosts. The soil must be prepared according to the general guidelines. If the peach crop is started on a soil that has been used for an orchard, the soil must be prepared 1-2 years in advance. To restore the soil structure and to eliminate the possible diseases outbreaks, the parcel can be planted using perennial herbs. If the parcel has been severely infested by weeds, the following herbicides can be applied: Roundup Classic, Roundup Energy. The base fertilizing can be done using 30-40 tons of organic compost. We recommend ploughing the soil to a 60-cm depth, as this will ease the root growth. If you cannot perform this procedure, manually plough the soil. Gather and remove all foreign materials from the soil. For a precise planting, the soil can be marked. This will help in establishing each tree’s position on the parcel. The optimum planting period for most species is the autumn season. This rule also applies for the peach trees. The seedlings will have to be procured from nurseries or authorized crop stations. The following planting scheme is recommended: a 5-m distance between the rows and a 4-m distance between the plants on each row. Before planting, the roots need to be cleaned up. The operation needs to be done to remove the wounded parts of the roots and to smooth the existing wounds. 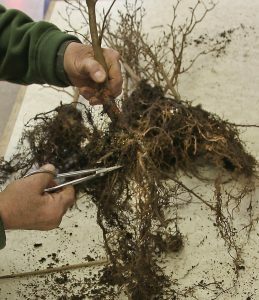 The dead roots need to be removed and the living roots need to be shortened to a 7-8-cm length. The purpose of this procedure is to maintain a healthy root system. The roots need to be cleaned up only if the seedlings have been recently taken out of the soil. The mulching part is next. Mulching represents placing the roots in a mixture of yellow soil, fresh organic compost and water. The mulching layer will assure a higher humidity around the root system. The mulching mixture needs to have the consistency of sour cream. If the seedlings have been transported on long distances, place them inside a water-filled vase for 2 hours, before mulching. This procedure will rehydrate the roots. This can be started by digging the holes. If the soil was not prepared in advance, the holes must be dug 2-3 months in advance and must respect the following dimensions: 100 x 100 x 80 cm. If the soil has been properly prepared, the holes can be dug only 1-2 days in advance, or even during the same day. If this is the case, the holes must respect the following dimensions: 40 x 40 x 40 cm. 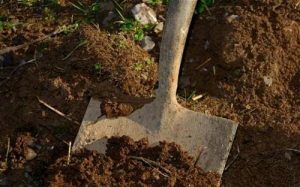 Pour a mixture of fertile soil, obtained from the upper part of the soil taken out of the holes, and well decomposed organic compost. Insert the seedlings into the holes in such a manner that its roots are directly placed onto the fertile layer from the bottom of the holes (poured there before first). After covering the roots of the seedlings using 10-cm of soil, press the soil around the roots. When planting, the roots must be in a close contact with the soil. The planting depth must be calculated bearing in mind that the grafting point must be 3-cm above and soil and orientated towards north. After planting, place a supporting stake next to the seedlings and apply a lot of water. The trees can be covered using anti-rodent protective materials. During spring, the trees must receive their required water intake. To make sure the seedlings will live and adhere to the new soil, an irrigation system will have to be installed. Around the trees the soil can be superficially sowed, or covered using vegetal residues (mulching). Mulching helps keep a good phytosanitary condition, prevents the weeds from growing, preserves the soil water and reduces the number of maintenance procedure that need to be carried out. During the first spring of the orchard’s life, the peach trees must be shortened to an 80-cm length. 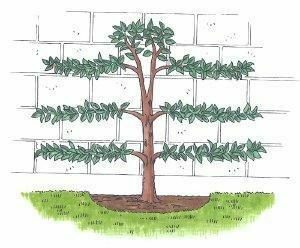 once the tree has entered its vegetation period, all sprouts that exceed a 50-cm length must be eliminated. Choose 3-4 sprouts from the tree’s superior side, that are evenly placed on the tree, to form the first layer of the crown. Eliminate the remaining sprouts from the plant. During the second vegetation year, the chosen sprouts need to be shortened to a 50-cm length, above a bud with an exterior orientation. The extension branch of the axle must be 25-cm taller than the first layer of the crown. This can be corrected by cutting above a bud with an exterior orientation. Leave 2-3 extension sprouts on the main 3-4 branches. The remaining growths must be taken out. During the third year, the extension sprouts of main branches must be shortened to 50-60-cm. The cuts need to be applied above a bud that has an exterior orientation. Pick 3-4 sprouts from the main axle, evenly placed on the tree, to form a new crown layer. Eliminate the competing branches and those that shadow each other. The remaining axle branches must be shortened to a 10-15-cm length to bear fruit. During summer, take out the greedy sprouts, the competing branches and those located on the superior side of the main branches. During the fourth year, the sprouts that have been chosen to form the second layer of the crown need to be shortened so that they are only 20-25-cm taller than the first crown layer. This is how you grow the peach trees’ crown layers. After four years of severe cuts, the peach tree will start to bear fruit. This is when the cuts will only be meant to keep the shape of the crown and balance the fruit production. During this period the greedy sprouts need to be removed by these cuts, or the dry or ill branches, and a balance will have to be kept between growth and fruition, so that the tree will not because exhausted. The cuts applied during summer are easier to be borne by the peach tree, due to their restoring capacities. During this period, take out the greedy sprouts and the overlapping branches. The tips of the young sprouts will have to be taken out. This process leads to the growth of the buds located beneath the cutting point. All cuts will have to be applied to a 45-degree angle and the wounds that are larger than 2-cm need to be covered using mastic. This is how the water will easily drain off the wounds. To conduct the growth and fruition of the trees, the following procedure can be carried out: changing the branch positions. This can be: training the branches, tilting the branches and arching the branches. Training the branches: this process means changing the natural branch position, by making them grow vertical. This makes the branch grow and strengthen. This process needs to be performed only during the trees’ maturity stages. This stage is when the vegetative growths lack, this process leads to rejuvenating the crown. Tilting the branches: this consists of changing the branch position by making them grow horizontally. This process leads to the growth of the fruit-buds and to crown airing. The branches can be bent to grow beneath the horizon level and this will increase the fruition. This procedure needs to be carried out during the young stages of the trees, when the vegetative growths are predominant. Arching the branches: by performing this position changing technique, the base part of the branch is ascending and the tip is bent beneath the horizon level (descending). This technique leads to the branch’s vegetative growth and to its garnishment. The trees that have had their branches arched will start to bear fruit 2-3 years in advance. The peach tree has high soil needs. This is why we recommend planting the orchard soil with perennial herbs. If there is an irrigation system set in place, plant vegetables or fruit bearing shrubs on the distance between the tree rows. Example: tomatoes, peppers, eggplants, onions, garlic, potatoes. Herbicides can only be applied 2-3 after planting. Products to be used: Centurion, Agil, Fusilade Forte, Pantera, Leopard. Considering the happenings of last year, the possibility or late frosts has increased. The trees can be protected against the late frosts by fumigating them. This consists of burning easily ignitable materials, that produce a large smoke quantity. Examples: rubber, hay, organic compost, oily residues, peat, etc. The materials need to be placed by piles. Use 80-100 piles for one hectare. This technique protects the trees from temperatures as low as -3 degreed Celsius. The peach tree needs extra fertilizing because it is a highly productive species. To produce one ton of fruits, the trees consume: 10 kg of nitrogen, 2 kg of phosphorus, 8 kg of potassium. Besides microelements, the trees also consume iron, boron, zinc, magnesium, etc. The young orchards need to be fertilized using 20 tons of organic compost per hectare (once every 2-3 years) and 300 kg of complex NPK fertilizer that needs to be applied manually. The mature plants need to be fertilized using 500 kg of complex NPK fertilizer (manually applied) and 40 tons of organic compost (to be applied once every 2-3 years). Leaf fertilizers need to be applied to ensure the plant’s needed microelements intake. The following products can be used: Cropmax, Amalgerol, BlackJak, Terra-Sorb, Florone, Raykat Engorde. An irrigation system must be installed to help the plant reach its maximum production capacity. By watering the trees during their pre-ripening phases, the production can be increased by 25%. Depending on the climate environment, the trees can be watered using 400-600 cubic meters of water per hectare. The best results can be achieved using localized irrigation and drip irrigation. 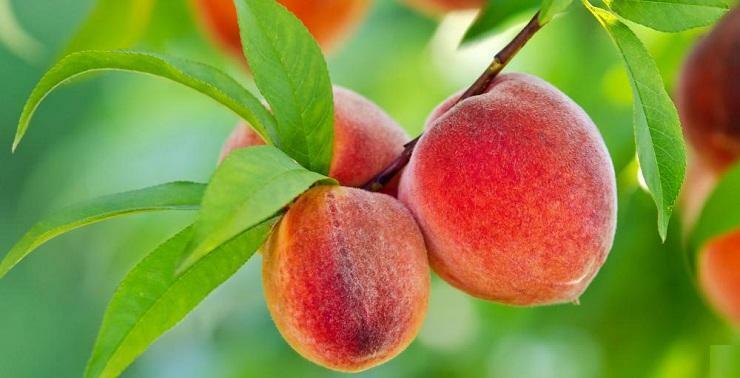 Being very fertile, the peach tree grows more fruits than its support and nourishment potential. To avoid branches from breaking and the tree from being exhausted, the fruits must be thinned. This process needs to be done at the end of June and it must be finalized before the pits harden. Make sure there is a 10-cm distance between the fruits on a branch. Use this opportunity to eliminate the fruits that are deformed or abnormally grown. The peach trees are affected by a number of diseases and pests that can jeopardize the entire production. If not treated in due time, these can compromise the harvest, defoliate the trees and in severe cases can destroy the entire plantation. To read more information about the diseases and pests that affect the peach crop, as well as the proper prevention methods, please click here. 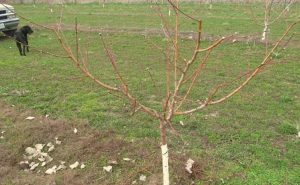 To destroy any possible diseases outbreaks from the orchard, apply the treatments during the vegetative rest period (winter). Apply these treatments during the first days of winter, when the outdoor temperature exceeds 5 degrees Celsius. To prevent diseases, use copper-based products. The first treatment needs to be applied once the leaves have fallen off. The second time you need to spray the trees is during spring, using copper-based products as well. These substances need to be dissolved in water and applied on the entire surface of the trees, from the base of the tree to their top. The following products can be used: Zeama Bordeleza, Champ, Funguran. These treatments will have to be applied during sunny days, when the outdoors temperature exceeds 6-7 degrees Celsius, so that the solution will not freeze on the plants. 7-10 days after the copper-based products have been applied, spray the plants using horticultural oil (150 ml for 10 l of water). Products to be used: Confidor Oil or Ovipron. The fruits reach their maturity at different times. This is why the harvesting process must be carried out in 2-3 phases. The peaches have a post-maturing capacity. The harvesting process can be done even before the peaches have reached their full maturity. 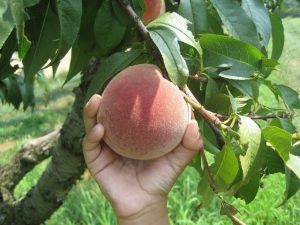 Generally, the peaches need to be harvested once they have reached the species’ specific size and color and once the pulp is firm. The peaches can be stored inside refrigerated warehouses for 2-3 weeks. The fruits need to be harvested during a dry and cool weather. The fruits need to be harvested along their peduncles, without pressuring the pulp. - Some substances are not allowed on planes. If the only way we can reach you is by plane, unfortunately some products will not be available to you for purchase. - Most countries have different views when it comes to which substances can be used on their territory. This means that some products will not be allowed everywhere.